Even the best-managed commercial cannabis cultivations must continually worry about, and defend against, pest infestation. When pests get out of control, it puts more than your high-value cannabis crop at risk. You face the loss of your reputation, as well as potential government intervention, batch failure and product recall. In fact, the cost of remediation for an outbreak is often five or more times greater than preventative care. With a proactive Integrated Pest Management (IPM) program, you can effectively keep pests at bay to avoid economic loss. As state and federal laws surrounding production of cannabis continue to evolve, low-toxicity approaches such as biocontrols can help ensure both regulatory compliance and safety for consumers and employees. Unlike traditional pesticides, most biocontrols are exempt from federal registration with the Environmental Protection Agency. Biocontrols are largely regulated by state departments of agriculture, so confirm with local regulatory authorities to ensure compliance. But what’s the best strategy for incorporating a biocontrol program? Is it right for your facility? Biological controls, also known as biocontrols, are beneficial living organisms such as predatory insects, mites, nematodes and microbes such as certain types of fungi and bacteria that can be applied as a method of controlling pests. When properly utilized, they help with common problems including fungus gnats, root aphids, spider mites, russet mites, whiteflies and thrips. • Predatory mites that eat other mites and insects, such as A. californicus, A. swirskii and A. andersoni, can be applied preventatively to the crop via breeder sachets — self-contained packages placed within the plant canopy that contain a food source for the predators, allowing them to breed and emerge in a “timed-release” way, minimizing application labor. • Parasitoid wasps such as Aphidius sp., Encarsia formosa and Eretmocerus eremicus turn aphids and whiteflies into mummies. • Chrysopa carnea, green lacewing larva, are voracious consumers of many soft-bodied insects at various stages of life, including spider mite eggs. • Parasitic nematodes (Steinernema sp. and Heterorhabditis sp.) and entomopathogenic fungi (Beauveria bassiana, Metarhizium anisopliae and Paecilomyces fumosoroseus) invade the bodies of many insect pests, using their host as a breeding ground. Large-scale horticultural facilities regularly rely on biocontrols to manage or eliminate pest populations. During a recent visit to a 100-acre field-grown strawberry operation in California, I witnessed a farmer applying Phytoseiulus persimilis — a predatory mite — to mitigate a spider mite population. Spider mites are ever-present in commercial agriculture and cannabis, but the use of predatory foliar mites can limit the spread of these pest mites. When should you use beneficials? Biocontrols are not the answer to every problem. They certainly won’t bail you out of web-covered colas in week seven. They must be used proactively. The idea is to maintain low levels of beneficials to watch over the crop, constantly searching for pests. If you have breeder sachets of A. californicus in your plants and a government inspector inadvertently brings in a couple spider mites while on a site visit, you won’t even know, because the californicus will take them out before they become a problem. The same goes for other pests. Once a large population of pests is established, beneficials can’t keep up with exploding populations. A knock-down spray treatment is necessary in these cases, with mild pesticides that won’t carry a residual effect that would prevent the next release of beneficials from taking hold. Horticultural oils are a good choice for this sort of knock down. The parasitic nematode, a nearly microscopic worm called Steinernema feltiae, is one of the most effective ways to handle those pesky, persistent fungus gnats. Steinernema, applied through irrigation or a “sprench” (spray/drench) actively search for fungus gnat larvae. They enter the pest larvae through a natural opening and reproduce inside, effectively killing the larvae. Steinernema, like many biocontrols, need to be applied fairly frequently. They can be a very cost-effective solution. As an added benefit, they also infect thrips larvae, so you have an added layer of protection from those pests. Phytoseiulus persimilis, commonly known as persimilis, is a voracious predatory mite that will consume all life stages of spider mites. They can eat up to 20 eggs or five adults a day. Thanks to their appetite and rapid reproduction, they are known to completely eradicate mite populations. I like using them in the plant clone stage to ensure you are going into early flower without spider mites. They can also be used to suppress small outbreaks. Many large cannabis and tomato greenhouses receive weekly shipments to spread in specific areas that are getting out of control. I’ve heard a number of growers say they haven’t had luck with bios in the past. This can be due to a number of reasons. Incorporating a biocontrol program can be tricky, but they certainly can work with some attention to detail. First, since bios are normally overnight-shipped from manufacturers, make sure they have arrived alive. When you have received a shipment, carefully inspect the organisms with a hand lens. Reputable beneficial manufacturers should replace them if you let them know of problems immediately upon delivery. A package of beneficial nematodes should smell earthy when fresh, not like decaying matter. Use a microscope to ensure viability of nematodes. Second, if there have been toxic and persistent pesticides used in an indoor facility in the past months or even years, residue may still be lingering that would prevent the beneficials from establishing and effectively controlling pests. Specifically, miticides like abamectin (Avid) are highly persistent indoors. Check with your supplier for specific concerns about pesticides. Third, you should start small and incorporate bios into a small portion of your facility. Carry a hand lens and monitor the effectiveness of your releases. Beneficials can be very hard to see cruising in the foliage, but if you dedicate a couple hours, you should be able to find them. I’ve seen no ill effects from introducing biocontrols. The beneficial insects released into production facilities are not attracted to the resinous, sticky buds of flowering marijuana plants; they’re attracted solely to pests. In the five years I’ve been managing and consulting for large-scale cannabis facilities, I’ve never gotten a report of any crop damage or failed microbial testing due to beneficials. I’ve also never gotten a report of someone finding beneficials in their finished product. I’ve also heard many growers say they avoid implementing a biocontrol program due to perceived cost of bios and concern over application details. It is not necessarily more expensive to use biocontrols when factors like employee time, chemical cost and limited working hours (due to restricted entry intervals) are considered. 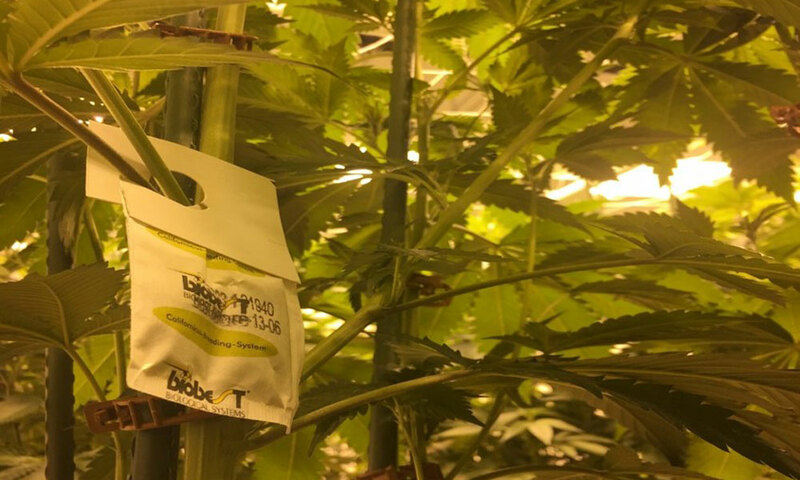 Many traditional greenhouse growers choose to incorporate biocontrols into their IPM programs because they are in fact good for their bottom line. Also, the value added to chemical-free crops may be extremely critical for some markets. Incidentally, the best bud I’ve smoke recently came from a facility utilizing bios. Good IPM decisions and implementation of biocontrol programs often require product expertise. When experts collaborate with growers, there do not have to be pest-caused crop losses. Just remember that IPM plans for large-scale cannabis growers should be designed to meet state-specific needs for regulatory compliance. Do you have a success story using biocontrols effectively in your own commercial facility? Please send me a message via the email in my bio below — I’m intrigued with the variety of unique approaches, and I’m happy to follow up in this forum with an update on biologicals.